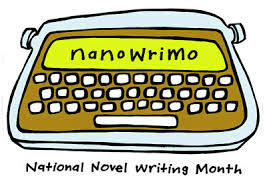 NaNoWriMo Participants aim to write a 50,000 word novel in November. As the last week of NaNo approaches, how are you all doing? Have you gone to write-ins? Have you gone to the forums on-line? I look forward to the writing frenzy every year. I missed a couple of years, but the five years I made it to the goal, I wrote five rough drafts. I’m a pantser so it was easy for me to type every day and meet the 50,000 word goal. But then comes the rewriting, turning the drafts into publishable novels. I’ve worked six years on one, Hada’s Fog. I have to put it away for a while. I found I wasn’t writing anything new and as much as I like revising (really, I do), I wanted to write something fresh. This year I took one of the NaNo drafts, Norman in the Painting, used the four beginning pages, and most of the same characters, but I changed the antagonist and the whole plot. I’m happier with it and it’s great to be writing a new story, instead of the same scenes over and over to make them perfect. Let me know your progress, I’ll cheer you on. Now over 43,000, and at it early this morning. It’s been a blast, even if I’ve kept my communal NaNo activities to a minimum. My heroine is now in the hold of a human-trafficking ship with two other women who are involved in solving a murder. No telling where stories will lead. That’s what I love about NaNo. The inner editor takes a vacation and you can let the story go to surprising places. Good for you…keep going.